This is the new Hublot Big Bang Bavaria and it's perfect for the Teutophile in your life. The piece is cut from bronze and strapped onto two robust, hand-embroidered bracelets in deer leather. It's the first time Hublot has cut the Big Bang case out of bronze. It's naturally non-magnet and resistant to corrosion, making it ideal for a watch case. The bronze is covered with a natural patina which will change and adapt over time. The back is in black ceramic and the screws finished in 3N gold. The cuff comes from Meindl's tanners, with centuries of expertise and tradition under its belt. It's been designed to be reminiscent of the Lederhosen, and features traditional sewing which gives a 3D effect effect to the leather. Each strap and case will be different and unique. Powering everything is Hublot's Unico, with 330 components for a 72-hour power reserve. “For over 10 years, the Big Bang collection has been confirming that all styles suit it. Denim, linen Pop art, thousand colors... it also emphasises traditions. After its collaboration with the lace of Saint-Gall Bischoff, Hublot has partnered with Meindl to create the Big Bang Bavaria." said Ricardo Guadalupe, CEO of Hublot. 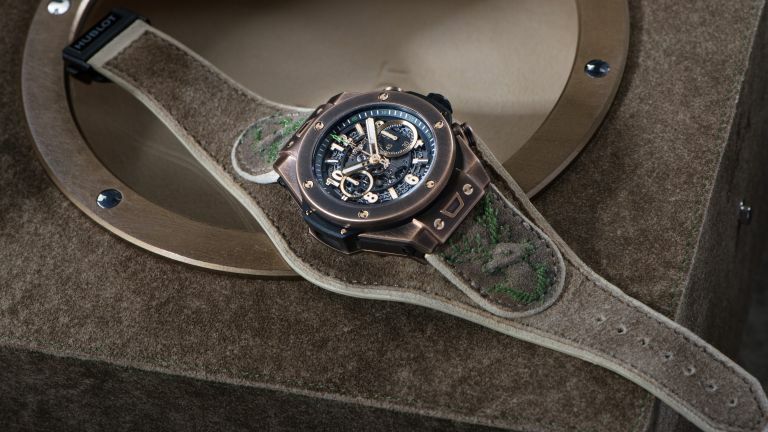 "This new piece is cut from an ancient metal—bronze, a metal that Hublot has loaded with tin and burnished—and its bracelet made from tanned hide, shaped and embroidered using age-old techniques.